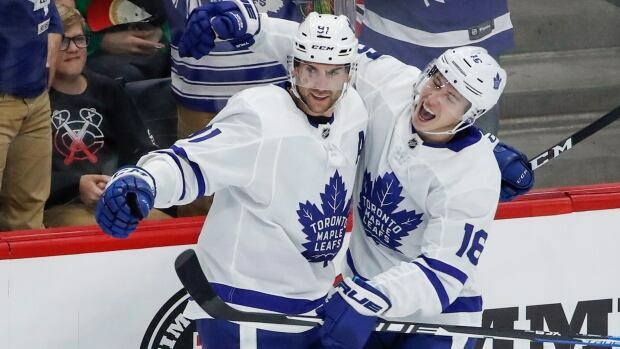 After John Tavares went off and Auston Matthews and Patrick Kane staged a memorable duel, Morgan Rielly got the last word on a wild Sunday night. Chicago was looking for its first 3-0 start since the 2012-13 season, but it was unable to clamp down on Toronto's high-scoring lines. Kane scored twice in the final two minutes of regulation, and defencemen Duncan Keith and rookie Henri Jokiharju each had three assists. It was Tavares' first hat trick since he agreed to a $ 77 million US, seven-year contract with Toronto in July, choosing his hometown team over several other suitors in free agency. The contract ramped up expectations for the Leafs, and the talented centre is already having an effect on his new franchise. "[I] want to be as consistent as I can so I prepare myself and expect a lot of myself on a nightly basis, with and without the puck," Tavares said.